This new budget Elatus release has two immediate things in its favour - the price, and Munch�s blazingly incandescent conducting. That said, there are down sides. The recording is reasonable, but certainly not in the top flight, with a rather boxy acoustic and congested climaxes. The orchestral playing is also suspect in many places, mainly due to Munch�s tempi, which are excitingly brisk but stretch the strings beyond their limits. The playing time is also miserly, even for budget price. 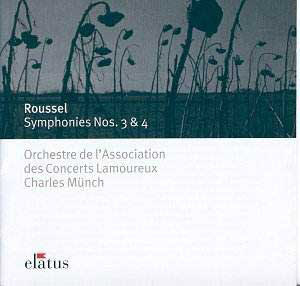 At least one more substantial item could have been fitted in, if not a whole symphony then one of Roussel�s many individual orchestral pieces. I mention this because it does become an issue when weighing up the competition. One of this disc�s main rivals will undoubtedly be the super-budget twofer from Ultima, which features Charles Dutoit and the French National Orchestra performing all four symphonies in a neat package and digital sound. At full price from Chandos one can get Järvi and the Detroit Symphony giving us Symphonies 3 and 4, as well as Bacchus et Ariane Suite 2 and the Op.52 Sinfonietta, excellent value indeed. As regards individual symphony performances, the front-runners for me are Bernstein in No.3 and Karajan in No.4. The Third was commissioned by Bernstein�s mentor, Koussevitsky, and the New York recording from 1961 is justly famous. I actually prefer his mellower but no less exciting account from 1981, played by the French National Orchestra and coupled with a superb Franck D minor. Karajan�s pioneering mono account of the Fourth comes from 1949, marvellously played by the Philharmonia at their peak, and coupled with Balakirev�s First Symphony. It is some measure of the musicianship of Munch that this Elatus release can compare with these illustrious accounts in many ways and make one forget the shortcomings. The very opening of the Third sets the tone immediately. The stamping rhythms, that one critic called �a cross between The Rite of Spring and Age of Steel�, are as fast and pungent as Bernstein�s New York account, and Munch has a cast iron grip on all subsequent proceedings. The big climactic outburst at 3.04 has a terrifying impact, and even the ragged ensemble that follows does not dim the effect. The slow movement�s long-breathed opening melody, deliciously angular and plangent, suffers a little from the sour French oboe tone, though ironically this may well have been the sort of sound Roussel had in his mind as he wrote it. I love Munch�s shaping of the little treading, Stravinskian ostinato at 2.59, though again playing is not as tight as one would like. The athletic finale, with its motor rhythms so redolent of Prokofiev, is taken at a daredevil pace which is intensely exciting, if a little too much for the Lamoureux strings. What a pity this was not Munch�s Boston Symphony, for we would have surely had a world-beating rendition of this great work, a piece even the famously spiky Norman Lebrecht refers to as �possibly France�s finest symphony this century�. The performance of the Fourth has many of the same attributes and problems. The work�s sharp contours, incisive rhythmic energy and eloquent warmth are all conveyed with unerringly musical judgement by Munch, who was a master technician with a phenomenal ear for detail and balance. This is offset once again by less than perfect ensemble work, ill-focused solos and sour tuning. The great Lento-molto slow movement is the heart of the piece, what one early reviewer called �the most exceptional and precious movement in the work�. Luckily, this is the bit that comes off best in this version, the relaxed but concentrated mood bringing out the best in the players. The Allegro scherzando displays a capricious Gallic elegance that is captivating, and the exuberant Allegro molto finale exhibits much of the muscular strength of the Third. Munch is well inside this music, and even if his under rehearsed players struggle to keep up with him (literally at times), his vision is such that there is a great deal to enjoy in these performances. Lack of refinement, both in playing and recording, are certainly compensated for in terms of visceral excitement and sheer hell-for-leather intensity. You may feel the need to turn elsewhere, especially for repeated listenings, but you could well be depriving yourself of the sort of performances that come along only rarely.